Unlike many sports, which have a small part of the year allotted to them, football is one which never seems to be on hiatus. No sooner had the previous season finished than there were major tournaments in the US and France (not to mention the Olympic competition), only for it all to kick off (literally) again before most fans had had a chance to catch their breath. Unsurprisingly, then, football is also a common topic in literature, and today’s post looks at a new arrival on the scene, a book which examines football and life to see if either can ever be fully mastered. “See you tomorrow,” Kevin cried. He was already engrossed in his text messages. At first, that kind of behavior drove me crazy, but now I’ve developed a bit of perspective. It’s a generational thing. There are no more sons of miners. That doesn’t mean that young guys today have no aims, they want to make money, soon they’ll want girls. But that’s just an incentive, and to have a career you need more than that. However, it’s not the best of jobs (or the best of teams), and as he watches his group of teenagers sullenly running around in the rain, he wonders if this is all life has to offer. Vincent’s personal life is little better. Having never really managed to hold down a long-term relationship, he spends long evenings alone in the large house rented for him by the club. Until, that is, his sister turns up one night to dump her son on Vincent’s doorstep. Suddenly, the solitary football coach has to play the role of supportive uncle, a role complicated by the realisation that there’s more to young Léonard than even his mother realises. Novels about football can be a rather hit-and-miss affair, and when they’re translated with an American audience in mind, that increases the chance of failure (c.f. Eduardo Sacheri’s Papers in the Wind). Luckily, then, especially given that some of the descriptions of the football are confusing for a British-English speaker like myself, The Penalty Area is less a story of the game itself than an examination of the relationship between two people thrown together by chance, but who have more in common than they would have imagined. Before she runs off, Vincent’s sister, Madeleine, warns him that Léonard is a rather unusual boy, and when the coach is forced to take the boy to his practice sessions, he sees this for himself. Having watched the first session, Léonard starts to take an interest in the intricacies of football, watching hours of DVD footage and coming up with theories on tactics which are astonishing for someone of his age. He then decides that he’d like to try out as a goalkeeper, with amazing results (in both a positive and negative sense). Vincent realises that he’s in over his head, but he has little choice but to attempt to make Léonard’s stay as smooth as possible. With Madeleine avoiding his calls, and another domestic cloud hovering on the horizon, Vincent’s life isn’t going to get easier anytime soon. 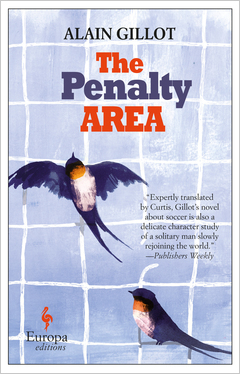 More than a book about football, then, The Penalty Area is a novel which examines how Vincent copes with the news of his nephew’s informal diagnosis, but also how it forces him to reflect on his own life. He must make adjustments to find space for Léonard in his life, knowing that the boy’s mother (a deluded dreamer ever chasing an imaginary pot of gold – or golden-hearted man) will be little help. Gradually, we also learn more about Vincent’s early years and the reasons his life is so cut off from the rest of the world. It doesn’t require a huge leap of logic to work out that Léonard isn’t the only one who struggles to adapt to any changes in his daily life. Gillot’s novel is a nice enough read, a book I got through in a couple of sittings, but it’s not all wonderful. As mentioned earlier, the football terminology grates with me (I suspect this was more the choice of American editors than the British translator), and it’s all a little superficial. The appearance of the beautiful Catherine Vandrecken, a doctor who falls for the morose coach, is a little too convenient, and as the pieces start to fall together towards the end of the book, it does feel a little like plotting by numbers. However, the way in which Vincent’s past slowly catches up with him is nicely done, and the growing relationship between Léonard and his uncle is convincing and touching. Karen – As I mentioned, it’s not really about football at all, more a story of a man coming to terms with his inability to make connections with other people (and a boy who helps him along the way…).